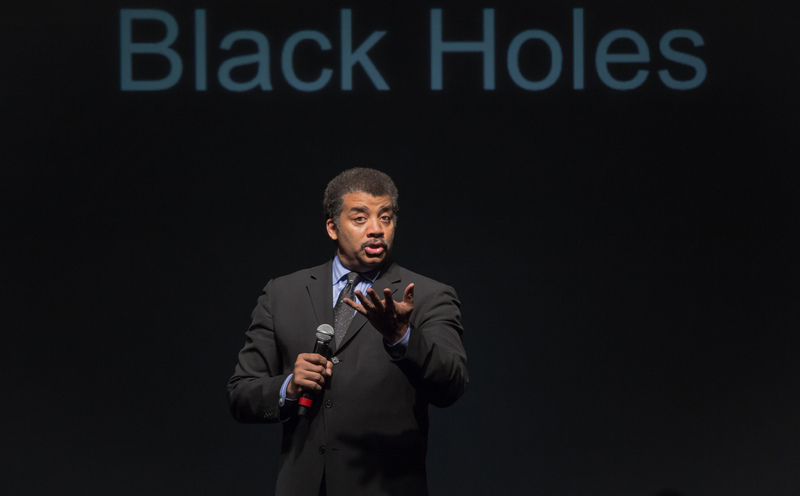 “Oh,” said the director of the Hayden Planetarium and host of the recent revival of the TV show Cosmos, “well, I have a planetarium.” The lecture, This Just In: The Latest Discoveries in the Universe with Neil deGrasse Tyson, was filled with a lot of humor, and even more science. The lecture was originally supposed to be in Ransburg Auditorium, but the university moved it to the basketball gymnasium, Nicoson Hall, after tickets sold out immediately. They sold out fast. Believe me, I know. I waited patiently to log on to the alumni website, even set an alarm—two alarms—to remind me when the tickets became available at 11 a.m. one day in September. Yet, when I logged in at 11:02, they were all gone. A few angry Tweets later, President Robert Manuel (@uindyprez) sent the word: remain calm, more are on the way. 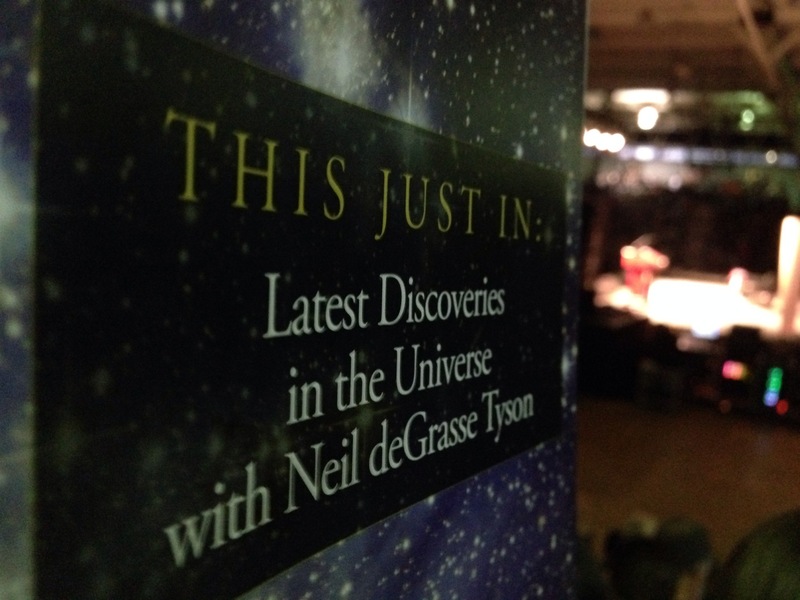 While introducing Tyson, Manuel noted that the astrophysicist’s appearance had caused the biggest buzz around campus since 1974, when Sonny and Cher performed at UIndy, then Indiana Central College. Tyson harped on the media for turning natural, regularly occurring events into some sort of phenomena—such as bestowing the names “blood moon” and “super moon.” But his biggest topic was asteroids. He talked about how many we’ve discovered in the last twenty or so years, and how many are on a collision course with Earth. “The universe is trying to kill you,” he said. 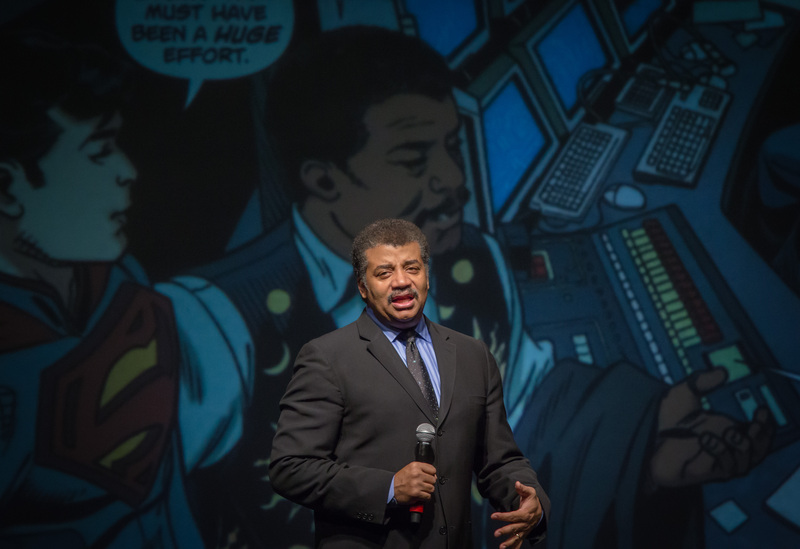 In the middle of his speech, Tyson received a phone call from another scientist of TV renown—Bill Nye. “Are you still changing the world?” Tyson asked his friend, after putting him on speaker. “Yes—but sometimes it takes me twenty-four hours,” Nye replied. Who knows if it was planned or not, but Nye encouraged the Greyhounds to change the world, too. The most interesting question asked of Dr. Tyson: Is it a good thing to look for signs of life in the universe, since, as Stephen Hawking and others have pointed out, any higher being would likely destroy or enslave all of human kind? Tyson said that Hawking was applying what he knew of human behavior—how badly we treat each other—to another, unknown being.